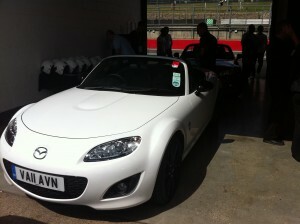 I was invited by Mazda UK to Brands Hatch today as part of their “Experience Mazda” “Adrenaline Rush” summer series. This was a chance – in my case, in the afternoon – to try out an MX-5 and a Mazda3 MPS on the track. And who was I to say no?! 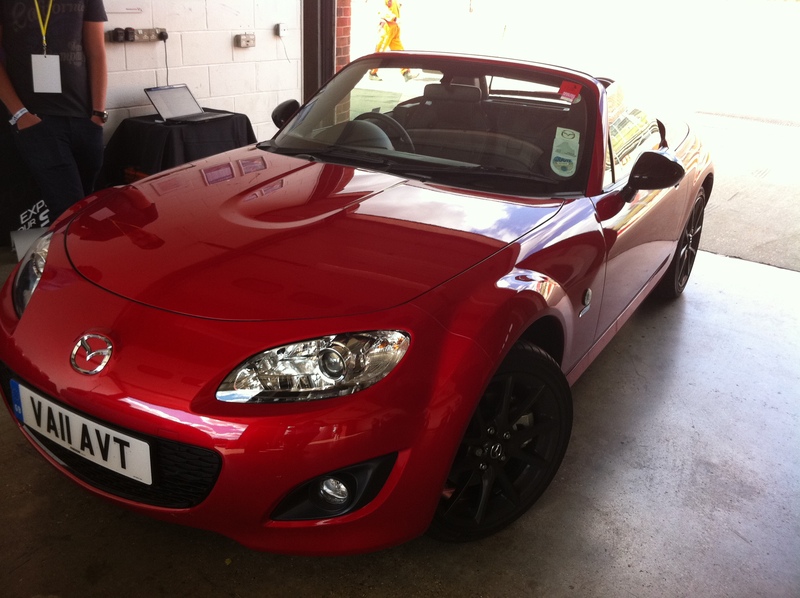 For my first drive, I was paired up with an instructor called Paul who sat beside me in the fab green MX-5 and gave me instructions as to the correct positioning, when to feed in power and when to feather the throttle and when to lift off altogether. After this session we came back in and Paul suggested he’d be happy to be my “wingman” for a later session. Excellent! Sadly, I was asked to wear something with sleeves or have to have the roof up, so despite it being warm and sunny I had to don my Superdry windcheater which was in the back of the RX-8 – I was a tad warm after each session. I took that as my cue and for my next MX-5 session we teamed up again and with his help put in some faster laps, keeping up even with a Radical! You could tell I was getting quicker as I was needing to grab 4th gear earlier and earlier out of Clark Curve onto the Brabham Straight. I didn’t want to learn a new car, especially a front wheel drive one after the rear wheel drive MX-5 (and my own RX-8 R3). 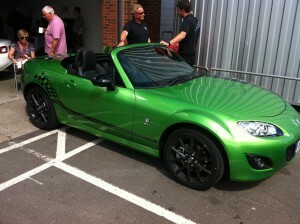 So I asked the Mazda guys and they said I could carry on with the green meanie (and Paul too!). For the final rush of the day, I was taken out by another instructor, this time in the passenger seat whilst he showed why he’s a racing driver and I’m not! 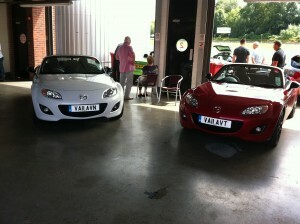 Much, much faster and pushing the MX-5 to (and almost beyond) the limits of adhesion of the poor tortured tyres. Talking of which, at the end of a day of being driven ragged around a tight circuit, I was amazed that the MX-5’s tyres looked hardly worn and the brakes still had excellent stopping power despite being very hot. Brake dust sprinkled all down the sides showed how hard the cars had been driven and they’d not complained once. The Mazda MX-5 Black Sport Limited Edition: understated excellence!